When I first starting doing P90X the one person besides my wife that I confided in as to what I was doing was my brother Chris. I tried to get him to do it with me but he brushed me off for almost a year. Then finally in the spring of 2009, he decided to join me on his own P90X journey after seeing my own results at a summer pool party. As you can see from the pictures he had AMAZING results. I sat down with Chris and asked him to share some insight on his P90x transformation. Coach Dave: What was it that finally clicked in your mind to do P90X? Chris: Well you had tried to get me to do it the first time you did and I wasn’t ready. You set me up with information on the nutrition and I was hoping to start slowly by doing the nutrition aspect first and then just do my own exercising. Of course I never followed the nutrition plan you created for me and before you knew it six months went by and it was summer. 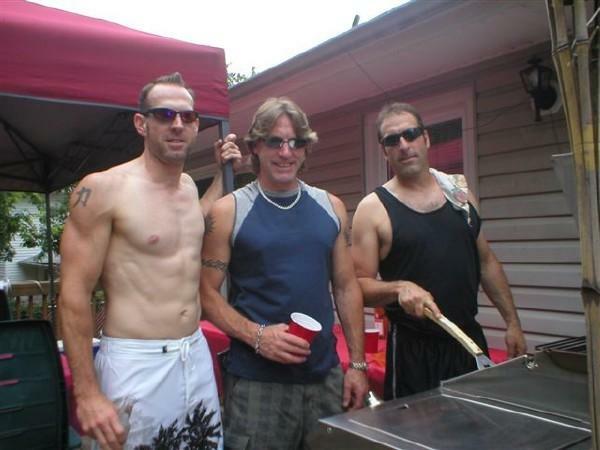 When we were hanging out swimming at Steve’s 4th of July pool party (note: Steve is my other brother) you looked totally ripped (pic to right). It was a shock to see you in that kind of shape and at least 10 people said to me privately, “What the heck is up with your brother? He looks incredible.” Even though I saw what you did and how good you looked, it wasn’t enough to motivate me to join you. It took nearly six months for me to decide it was time that I wanted to get ripped like you and have people talk about me the same way. I also decided I wasn’t getting any younger and it was time to do something about getting healthy. Coach Dave: So what did you do? Chris: Well, as you know, we ordered me P90X and I made you my coach. When it came I dedicated myself to the nutrition plan and the workouts. At the end of the three months I lost 22 pounds and was stoked to see my results. It was hard work but not impossible. I’m pretty much proof that anyone can do this if they set their mind to it and stick to the program. (The pic to the left is me with Chris at another summer party at Steve’s house the following year). I also want to say that you were a great motivator and help throughout. Anytime I had questions or problems, you were right there to help and put me back on track if I lost focus. I know people are going to say “you have to say that, he’s your brother” – but I can honestly say I know you are the same way with all the people you help through your coaching.